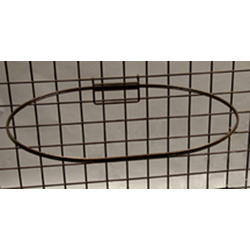 These rings are perfect for adding wicker baskets to any gridwall display. This will give your retail space a unique aesthetic. Rear hook support ensures that the baskets are attached securely and wire ring keeps a tight grip on you product. These rings are available for use with three different sized wicker basket products to fit you specific display needs. You can even use them in combination with one another for a truly dynamic and unique display area.